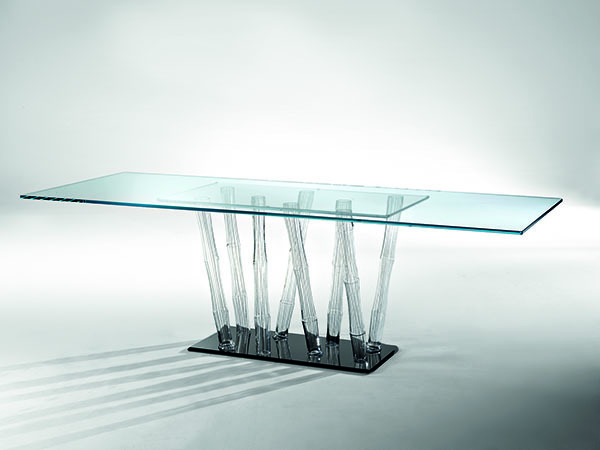 DINING TABLE WITH BASE COMPOSED BY MURANO GLASS TUBES TRANSPARENT WITH BLACK FILIGREE. SOCLE IN SMOKE-GREY MIRROR GLASS. EXTRA –CLEAR GLASS TOP 15 MM TH. ALSO AVAILABLE WITH WOODEN TOP 40 MM TH WITH ROUNDED EDGES.